No recent reviews found for your area. Get your LocalHarvest.org Organic Cotton Farmers' Market Bag! 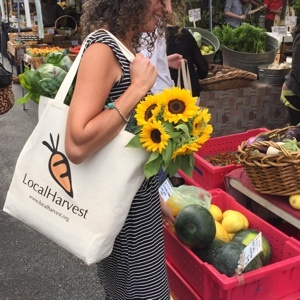 Over the years, many of you have asked for a way to support LocalHarvest and show your affiliation, so we searched for the perfect farmers market bag and found it! This tote is made in the USA of sturdy 100% organic cotton canvas and is adorned with our carrot logo. Buy yours today and you will be supporting a great cause! Copyright © 1999-2015 LocalHarvest, Inc.